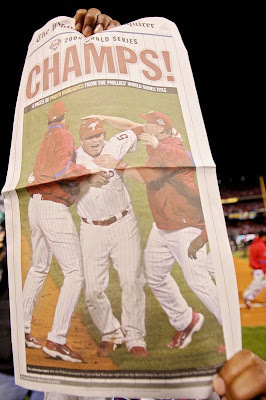 The American Portrait: Philadelphia Phillies: 2008 World Series Champs! In case you haven't heard, my hometown team, the Philadelphia Phillies, just won the World Series and are the BEST team in baseball. This championship really belongs to Philadelphia fans who patiently stuck with their baseball team for 28 years (25 of which spent waiting for any championship). Philly fans take a lot of heat for being passionate about their sports. You will not find another city that rewards hard work and dedication and punishes lack thereof like we do. For one year we can say we are truly the "team to beat".